- Injury report: For the Raptors, Fred VanVleet (left thumb) is out. The Raptors announced on Monday that VanVleet has a partial ligament injury to his left thumb. He will wear a splint for approximately three weeks and his condition will be updated as appropriate. For the Wizards, Dwight Howard (L4-L5 lumbar microdiscectomy procedure), John Wall (left achilles tendon tear) and Troy Brown Jr. (left ankle sprain) will be out. 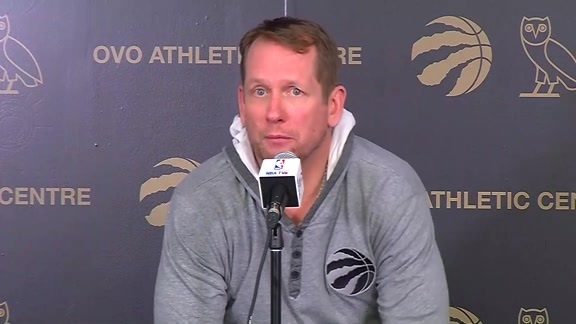 - All-Star break: After Wednesday’s game, the Raptors will officially be on All-Star break, their next game not occurring until Friday, Feb. 22 when they host the San Antonio Spurs at Scotiabank Arena. With Monday’s win against the Brooklyn Nets, the Raptors have set a franchise record with 42 wins recorded before the NBA All-Star break. Toronto will be well represented in Charlotte for All-Star; Kyle Lowry and Kawhi Leonard will represent the team in the All-Star game, OG Anunoby will play in the Rising Stars game and Danny Green will participate in the three-point shooting contest. - Recent history: This will be the final regular-season meeting between the Raptors and Wizards. Toronto has won all three previous games against Washington this season, most recently a 140-138 double-overtime thriller on the road. Kawhi Leonard had 41 points and 11 rebounds to lead the Raptors, Pascal Siakam had 24 points and 19 rebounds (before fouling out), and Serge Ibaka drilled a three-pointer with 15 seconds remaining to seal the deal for Toronto. The Wizards are in Toronto following a 121-112 loss against the Detroit Pistons on Monday. - Five straight: Thanks to Toronto’s 127-125 victory against the Brooklyn Nets, the Raptors have now won five straight games. After a tightly-contested fourth quarter, and the score tied, Kawhi Leonard hit a bank shot with 4.2 seconds remaining to lift the Raptors past the Nets. He finished with 30 points and a career-high eight assists. Leonard has scored at least 30 points in 18 games this season and is averaging 27.0 points per game, putting him eighth in league scoring average. 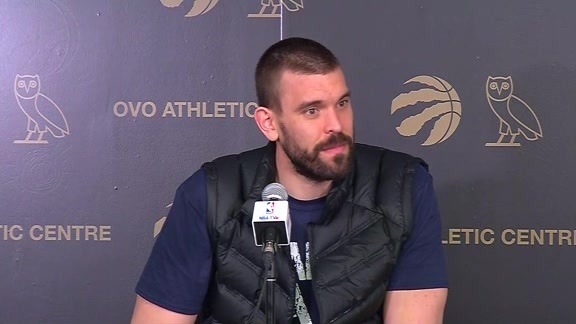 - Home debut: Marc Gasol made his Scotiabank Arena debut on Monday and it didn't disappoint. He scored 11 of his 16 points in the fourth quarter, in a flurry where he also directed traffic on both ends of the floor, found his cutting teammates for open buckets, was a defensive presence around the basket and also drilled a three-pointer for good measure. Gasol finished with 16 points, six rebounds, two assists, a steal and a blocked shot in 22 minutes. He shot 7-for-9 from the floor and 1-for-1 from beyond the arc and the Raptors crowd gave him a standing ovation when he was introduced. “It gives you butterflies in your stomach when you get those," Gasol said of the cheers. "Makes you feel kind of like a rookie again. It was a good feeling, a great feeling to have."